Be the first to share your favorite memory, photo or story of Elsie. This memorial page is dedicated for family, friends and future generations to celebrate the life of their loved one. 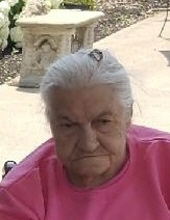 Elsie Harrison was born September 23, 1928 in Jackson County and departed this life Thursday, March 28, 2019 at the Baptist Health Hospital in Lexington, being 90 years of age. She was the daughter of the late Eunice & Rosie (Clemmons) McKinney. Elsie is survived by two daughters, Connie (Michael) Tankersley of Waneta and Bonnie (Arnold) Snipes of Fremont, NC and by three sons, Ronnie Harrison of McKee, Donnie (Donna) Harrison of Waneta and Vonnie “Mousey” Harrison of Waynesburg. She was blessed with twenty grandchildren and a host of great grandchildren. In addition to her parents, Elsie was also preceded in death by her husband, Earl J. Harrison; by her son, Johnny Harrison and by the following siblings, Harlan, Bill, Arvil, James & Gladys McKinney, Bessie Rose, Betty Isaacs and Bernice Rose. "Email Address" would like to share the life celebration of Elsie Harrison. Click on the "link" to go to share a favorite memory or leave a condolence message for the family.